Custom home theater includes the incorporation of the whole house audio and lighting system for a greater experience. Whole house audio is a system of deliberately placed speakers throughout every room and space in the household from the kitchen to the shower, from indoors to outdoors — you will enjoy the benefit of themulti zone audio wherever you are! Whole house distributed audio system includes three basic stages: The design stage, the pre-wiring stage, and the installation stage. The design stage Includes designing a floor plan with specific information for the whole house audio system installation plan. We consider our client’s budget, preferences and desires and we will either design a single-zone system, with speakers playing the same audio at once, or a multi-zone system that offers different audio sources in different spaces of the residence. We work with specific budget sizes for the best speaker selection and incorporation possible. In pre-wiring stage we will pre-wire a distributed audio system according to the specific floor plan designed in the earlier stage. 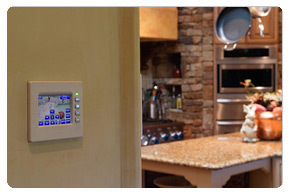 Pre-wiring stage presents convenience, flexibility, and saves money on the installation costs. In designing the whole house audio system we will determine the source equipment and its location, design speaker location plan, and decide on where we will install the speakers into the walls, whether concealing, or free-standing them. Installation stage includes the final installation process that incorporates the plan designed in the previous stages for the whole house audio systems. Home audio installation is the most intriguing final stage where the design on paper comes alive on the stage!